The zealotry of über-progressive students turning against their progressive professors has occasionally attracted coverage by the mainstream media. The most recent example is the bullying of Evergreen State College biology professor Bret Weinstein, who recounts his ordeal in the Wall Street Journal under the grim title “The Campus Mob Came for Me—and You, Professor, Could Be Next.” But as James Kirchick showed in a recent article, some universities actually encourage and reward this kind of behavior. In short, as far as CUNY is concerned, it is fully justified to ignore all criticism of Sarsour and to present her as a role model for the university’s graduates. As Michael D. Cohen of the Simon Wiesenthal Center acknowledged when he recently denounced Sarsour as “an arsonist in our midst,” she is “a brilliant tactician who manipulates the media to gain attention and sympathy for her cause.” One might add that the media love to be manipulated by her, without asking tough questions about what exactly Sarsour’s “cause” is and how she pursues it. During one of the recent controversies, Sarsour declared that she wants to be judged by her own words, but it is abundantly clear that she also wants people to ignore plenty of her own words that actually tell us a lot about Sarsour’s “cause” and her activism. So let’s look at a small sample of those of Sarsour’s own words that are arguably very revealing, even though she will lash out at anybody who quotes them to her. Indeed, Sarsour was recently recorded berating a student who asked her about her notorious tweet from 2011, when she declared that prominent women’s right activist Ayaan Hirsi Ali and strident Islam critic Brigitte Gabriel “don’t deserve to be women;” therefore, Sarsour wished she “could take their vaginas away.” If we take Sarsour’s response to the student who asked about this tweet seriously, White men (capital W, please!) have no business being disturbed by her vile outburst – an answer that reflects the divisive identity politics Sarsour often employs when it suits her, while calling for unity and solidarity when this seems more opportune. But as the Dartmouth students who enthusiastically applauded Sarsour’s put-down of their impertinent White male fellow student illustrated, many people are all too willing to ignore an obscene six-year-old tweet posted when Sarsour was almost 31 – not, as she falsely claimed, in her twenties. Moreover, in spring 2011, Sarsour reportedly already served as director of the Arab American Association of New York; she was also about to be named “a fellow at the NYU Wagner Graduate School of Public Service Women of Color Policy Network” and boasted about her excellent access to the Obama administration. Isn’t it deeply ironic that CUNY would so strongly defend its decision to honor Sarsour who celebrated so enthusiastically when she and other activists succeeded in denying a similar honor to Ayaan Hirsi Ali? Since Sarsour often emphasizes her Palestinian Muslim identity, it is also interesting to note how Palestinians view sharia. As documented in a Pew survey from 2013, 89% of Palestinians want sharia law; 66% endorse the death penalty for Muslims who convert to another religion; 76% support mutilation as a punishment for theft, and a shocking 84% want adulterers stoned to death. The survey also shows that less than half (about 45%) of Palestinian Muslims reject so-called “honor killings” as never justified, and 87% insist that a wife must always obey her husband. Well, maybe CUNY should start a “Sarsour Program for Arranged Marriages” to benefit female students in their last year of high school? One really is left to wonder if Sarsour is too naïve to realize that if she transforms Islam’s founder into a 21st century social justice warrior, she ultimately legitimizes those who employ the norms of our time to denounce him for his marriage to an underage girl (which was then common and unfortunately remains accepted in some countries); similarly, by the standards of our time, the supremely successful warlord, who founded not just a faith, but also an empire, committed numerous atrocities. So much more material could be cited to show how little Sarsour deserves to be held up as a role model for graduates of a respected American university, but let me just conclude with this: when Sarsour addresses her audience at the commencement ceremony of the CUNY Graduate School of Public Health and Health Policy and says she is honored to do so, remember that she also recently said she was “honored” to share a stage with convicted terrorist murderer and confessed US immigration fraudster Rasmea Odeh. A previous version of this post was first published at EoZ. A powerful post from Nick Cohen — and a must-read if you think we have freedom of the press and freedom of speech. “Classical anti-Semitism, it should be remembered, proclaimed the Jews as a minority group to be an existential menace to a given nation—a danger to its internal homogeneity, unity, religious values, and racial purity. Postwar anti-Zionism, on the other hand, sees the nation of Israel above all as a deadly threat to world peace and the international order. This was the verdict of nearly 60 percent of Europeans polled in a Euro-Barometery Survey in October 2003, when Israel reached the number-one spot in the hit parade of nations that imperil universal tranquility and brotherhood. Yet the change is not as deep as one might assume. Professor Robert S. Wistrich, “The Changing Face of Anti-Semitism” – an essay based on a presentation to a forum of the European parliament in the summer of 2012. No, the title of this post doesn’t mean that Ali Abunimah of the Electronic Intifada hopes President Obama will achieve an Israeli-Palestinian peace agreement in his second term. After all, like most “pro-Palestinian” activists, Abunimah is not primarily interested in the establishment of a Palestinian state, but rather in getting rid of the Jewish State. Yet, as much as so-called pro-Palestinian activists may hate Israel, they often also have plenty of other resentments that add up to an utterly unhinged world view. There is perhaps no better way to examine the fringe views that are so popular in “pro-Palestinian” circles than to follow Ali Abunimah on Twitter. It is noteworthy that in this tweet, support for Israel ranks only third in the list of Democratic faults. That is because Abunimah was also tweeting a Reuters report published by the Palestinian Ma’an News Agency that described how some Pakistanis reacted to Obama’s re-election. Of course, Ali Abunimah doesn’t usually care all that much what’s going on in Pakistan, and he certainly wouldn’t like it if people started to compare all the attention the Palestinians are getting to the disgraceful neglect of the Baloch struggle against Pakistan’s murderous oppression of their aspirations for freedom. So in the world of Ali Abunimah and his many fans, the US president and the generals who serve in the US army are all just murderers and criminals. Well, with all this influence Abunimah fancies himself having, Obama has already one leg in prison… Of course, there may be severe overcrowding, since most US generals should probably also be there, and let’s not forget George W. Bush and all Israeli leaders and generals and whoever else isn’t in favor of the glorious “resistance” put up by Islamist terrorists in the Middle East and elsewhere. This is a belated cross-posted from my JPost blog. In response to this post, G-Nice‏@ArikSharon alerted me to an interesting piece written by the widely respected Palestinian* commentator Hussein Ibish a few years ago. Under the title “What does Ali Abunimah really believe?,” Ibish notes that he and Abunimah wrote “numerous articles and monographs” together, but that Abunimah’s views “have shifted radically in recent years.” Ibish also points out something I’ve often noticed when reading Abunimah’s output: namely, that he “tailors his statements to appeal to different audiences in different media at different times” – which perhaps indicates that he is aware that openly standing by the unhinged views with which he fires up his fans would come with the price of not being taken serious by a less partisan audience. But since Ibish uses the term “agenda,” it’s worth highlighting that Abunimah combines his enthusiastic cheerleading for Hamas and Islamic Jihad with a relentless demonization of Israel, passing it off not only as “pro-Palestinian”, but also as a progressive defense of human rights. This is of course exactly the kind of “pro-Palestinian” activism that has done so much to poison progressive politics. Whether or not Abunimah’s activism can be described as “pro-Palestinian,” it sure qualifies as obsessively anti-Israel. Yet, as Palestinian President Mahmoud Abbas has demonstrated with his recent speech at the UN to much applause, it indeed seems that championing the “Palestinian cause” is generally understood as requiring harsh denunciations of Israel. Those who are consumed by hate for the world’s only Jewish state and dedicate themselves single-mindedly to the goal of undoing its establishment tend to exhibit similar failures of comprehension – which is arguably no coincidence given the often observed overlap between anti-Zionism and antisemitism. This is certainly true for Ali Abunimah and many of his fellow activists and followers. Yet, while Abunimah has repeatedly tried to distance himself from activists who propagated antisemitic tropes all too openly, there is no denying that the politics of the supposedly “progressive” down-with-Israel crowd differs very little from the hate-filled visions of antisemites. As hard as Abunimah may try to pose as a progressive anti-racist and defender of human rights, his enthusiastic cheerleading for Hamas and groups like Islamic Jihad ultimately means going along with the seething Jew-hatred expressed in the Hamas Charter and in countless jihadi pronouncements. But there is arguably more to it, because – as I tried to illustrate by highlighting Abunimah’s views on Obama – dedicated anti-Israel activists like Abunimah tend to have radical fringe-views not only on Israel, but also on many other issues. Perhaps unsurprisingly, the down-with-Israel-crowd also hates a lot about America and the West in general – and this hate is so all-consuming that there seems to be little else. Those who happily subscribe to these fervent resentments will therefore usually be unable or unwilling to see the Middle East and the Muslim world as anything but victims of Western depravity. Whatever might be wrong there is not deemed worthy of attention given the enormity of Western wrong-doing. “Without self-criticism and its accompanying learning curve, there is little progress. Hence progressives rightly emphasize self-criticism. […] In some cases, however, self-critical progressives can take this strategy so far that they fall into the trap of taking most or all of the responsibility for something when it is not primarily of their doing. To some extent, this unusual generosity reflects the notion that it takes a “big man” to admit fault, and that if we progressives are stronger, we should make the first, second and even third moves of concession and apology, in order to encourage those with whom we find ourselves in dispute. Combining inflated rhetoric with a therapeutic notion that the disadvantaged should not be held to the same exacting standards (moral equivalence) leads one to fall into self-critical pathologies. *Correction: Somebody on Twitter protested my description of Ibish as Palestinian, and indeed it seems I was mistaken. There is only very little information on Ibish’s family background available, but a 2003 obituary of his father, Professor Yusuf Hussein Ibish, indicates that he came from a Syrian-Kurdish family while his mother Joan Schenck was apparently European or American. Last week, opponents of free speech had a great time in New York City. While the representatives of OIC member states took to the UN podium to demand restrictions on freedom of expression, one of the organization’s member states had the great satisfaction to see one of its nationals demonstrating right there in New York that there was always something to offend Islam. 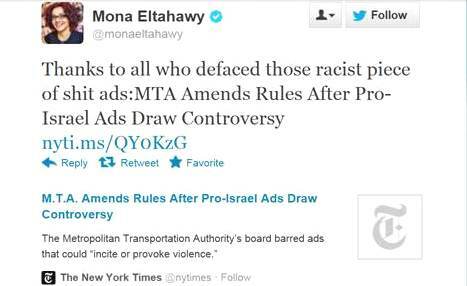 Incensed by an ad in the New York subway that denounced violent jihad as “savage” and called for supporting Israel, the prominent Egyptian-American writer Mona Eltahawy decided to register her objections to the ad. She did so, however, not – as one might have expected – by writing an article explaining her objections and her apparent identification with violent jihadis, but by seeking out one of the ten posted ads and defacing it with spray paint. A brawl ensued when Eltahawy encountered a woman who tried to stop her from defacing the ad, and Eltahawy was arrested and held overnight to face a criminal mischief charge in court on the following day. Given that she has a large following on Twitter, it was hardly surprising that, as soon as the news of her arrest spread, her supporters started a campaign with the hashtag #FreeMona. It was then that it first became clear that Egypt’s ruling Muslim Brotherhood was pleased with Eltahawy’s actions: Ikhwanweb, which represents the “official opinions of the Muslim Brotherhood,” posted a tweet in support of the #FreeMona campaign. 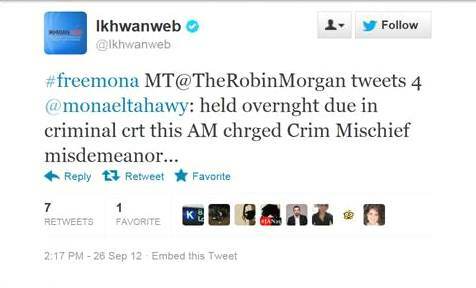 When Eltahawy was informed about this after her release, she, in turn, seemed pleased enough to retweet it. Responding on Twitter, Eltahawy ultimately rejected Morsi’s concern, advising the Egyptian president that he had enough challenges at home and that there was no need to worry about her. But apparently, Eltahawy didn’t bother to ponder the question why Morsi and the Brotherhood had been so eager to show support for her. After all, she had made a name for herself as a “heroine of the Arab Spring” by being very open about the physical and sexual abuse she suffered when she was arrested while covering demonstrations in Cairo in November 2011. Half a year later, she caused a heated controversy with a feature essay in Foreign Policy magazine. Under the title “Why Do They Hate Us?,” Eltahawy asserted that there was a “war on women” in the Middle East and that “Arab societies hate women;” she also sharply criticized the views of the Muslim Brotherhood and its spiritual leader Yusuf al-Qaradawi on female genital mutilation. While we can safely assume that the Brotherhood didn’t appreciate that at all, they were of course astute enough to warmly embrace Eltahawy now when she was acting in a way that was obviously very useful for the OIC’s efforts to push for restrictions to free speech. Indeed, Mona Eltahawy has repeatedly emphasized that she was proud of her actions (and, presumably, their success) and that she wouldn’t hesitate to do the same again. At the same time, she has so far avoided to use her freedom of speech and her many possibilities as a prominent writer to explain why she would take offense when violent jihad is described as savage, and why she is so outraged by Qaradawi’s views on women, but apparently unperturbed by his glorification of genocidal jihad against the Jews. Asserting once again that the ads she defaced were “racist and bigoted” and suggesting a “coincidental correlation” to various instances of anti-Muslim violence and verbal abuse hurled against her (who loves to hurl verbal abuse against others), Eltahawy fails again to explain why condemning violent jihad as “savage” is “anti-Muslim,” but she does repeat her identification as a #ProudSavage. “[Günter] Grass’ fundamental conceit—that Israel, and not the countries threatening to wipe it off the map, will be responsible should war erupt once again in the Middle East—is the same as [Judith] Butler’s. Both rely on naïve and simplistic conceptions of “imperialism” and “anti-imperialism” and on a belief that power inevitably leads to oppression. […] Butler—who, as a Jew, is uninhibited in what she can say about Israel in Germany—has said what Grass declared in his poem: Israel is the problem. The Israeli “state violence” she complains about exists in a vacuum; Iran’s march to nuclear weapons does not concern her, and the violence of Hamas and Hezbollah is all but ignored. Following World War II, many Germans internalized pacifism as a fundamental political value, and it is this central belief—as well as the ability to sit in judgment of the Middle East from comfortable, prosperous Europe—that informs much of German attitudes toward Israel. Joschka Fischer, the erstwhile left-wing student activist who rose to become Germany’s first Green Party foreign minister in 1998, used to say that there were two principles that formed his political consciousness: “Never Again War” and “Never Again Auschwitz.” But when the possibility of genocide returned to the European continent during his tenure, in the form of Serb ethnic cleansing in the Balkans, these mantras came into conflict. If preventing another Auschwitz on European soil required war, the breed of German leftists embodied by Fischer argued, then it was the duty of the German left to get over its aversion to force and support war. As my own post on this issue illustrates, I fully agree with Kirchick’s criticism of Berlin’s Jewish Museum. The only minor point I would raise here is that, when he says that both Grass and Butler “rely on naïve and simplistic conceptions of ‘imperialism’ and ‘anti-imperialism’ and on a belief that power inevitably leads to oppression,” one should perhaps highlight very clearly that, as far as Grass and Butler are concerned, it is of course only Western power that is seen as so inevitably oppressive. While this is already implied when Kirchick points to their “naïve and simplistic conceptions of ‘imperialism’ and ‘anti-imperialism,’” it is crucially important to understand the patronizing attitude that hides behind these supposedly “naïve and simplistic conceptions:” Only the West has agency and the power to do evil, while the non-West is reduced to passivity and the role of the victim. “Hezbollah is notoriously hostile to every social value liberals and progressives hold dear, from women’s rights to gay rights, with one exception. Hezbollah says the United States and Israel are the Great Satan and the Little Satan. That’s it. That, all by itself, is enough to get a socially retrograde totalitarian terrorist organization labeled ‘progressive’ even by a professor who adheres to non-violent politics.